By John Pippin, M.D., F.A.C.C. He was only 8 years old when he was loaded onto the truck that he would not exit alive. Chaos, a young chimpanzee, died on May 31, 2011 during transit as he was being shipped from one laboratory to another. 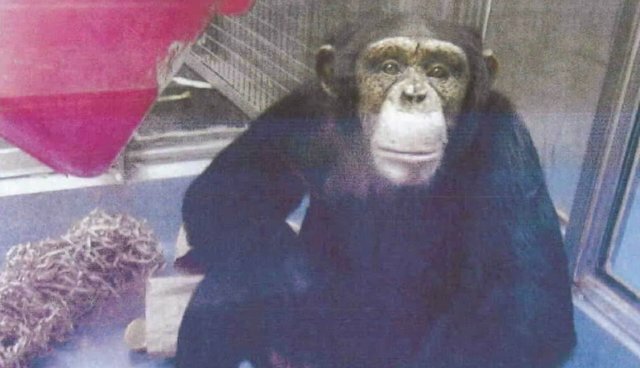 During that approximately 1,200-mile journey from Bioqual in Maryland to New Iberia Research Center in Louisiana, Chaos, who had been used in experiments since he was 2 years old, suffered anaphylactic shock with complications and died. It's hard to say who had a worse fate-Chaos, or the chimpanzees like Reggie and Emma who arrived at New Iberia with their hearts still beating. Nearly three years later, Reggie and Emma are still at New Iberia Research Center. Still living in captivity. Still in danger of being used in invasive experiments. Still suffering mentally, and perhaps physically, every day. I can't even imagine what they've been through in just the last three years. For Chaos, it was too late. But Reggie and Emma can still be released to a sanctuary to live out their lives and begin to recover from years of darkness. A new publication could help get Reggie and Emma out of New Iberia faster. As a physician and former animal researcher, I know that chimpanzee experiments are a dead end. Most labs, including Bioqual, have stopped experimenting on chimpanzees since we now know so much about their emotional capacities-and that they aren't a good stand-in for humans in medical research. The federal government is already phasing out its support of chimpanzee experiments, releasing hundreds of chimpanzees to sanctuaries-including more than 100 National Institutes of Health-owned chimpanzees at the same New Iberia Research Center. Reggie, Emma, and other chimpanzees at New Iberia are privately owned though-just their luck. They don't fall under the federal government's phase-out of chimpanzee experiments. But under the guidelines in a new paper in Theoretical Medicine and Bioethics, they could no longer be subjected to experiments. The paper, "Chimpanzees as Vulnerable Subjects in Research," says chimpanzees used in experiments should be treated as vulnerable subjects vulnerable to exploitation and harm. Everything from the actual invasive experiments, blood draws, and biopsies to captivity and transport causes chimpanzees stress and pain and can even lead to post-traumatic stress disorder. And as Chaos' case showed, even just being transported can be so stressful that it kills a chimpanzee. New Iberia has both the largest chimpanzee laboratory in the world and a long rap sheet for repeated serious Animal Welfare Act violations. Behind its locked doors, baby chimpanzees have died as a result of overcrowding and negligent management practices. I just wrote to New Iberia's director to urge him to immediately release Reggie, Emma, and all other chimpanzees to sanctuaries to avoid any further harm. There's no time to waste in getting Reggie and Emma out of New Iberia-and in getting all other chimpanzees out of labs.